Teacher's Notes: Are e-books Hindering Your Child's Literacy? Like many children, my toddler knows how to stall bedtime. She lingers over her bookshelf, picking up one hardcover after another, carefully considering the merits of each picture book before making her final selection. Perhaps if I introduce a little technology to our evening story time I could speed up the selection process. She would take a tale on a tablet every time. Unlike the near-unanimous recommendations to limit screen time, the debate about the value of e-books is far from resolved. Many argue that sharing ebooks with children is a valuable life skill, since tablets are tools common in the workplaces and classroom. When used in elementary schools, e-books have shown enormous potential to serve as fluency models and captivate reluctant readers. Plus, many picture books adapted for electronic devices have features designed to engage kids and enhance the reading experience. Others argue that those very features distract from the story and can actually hinder literacy, particularly the games and songs often found in e-books. Luckily, a thoughtful approach to choosing and sharing e-books can mitigate most problems. The two most recent comprehensive studies on e-books both found that there is a potential for tablet features to offer no literary value to the story. Researcher Heather Ruetschlin Schugar writes that the bells and whistles common in e-books can overwhelm children’s memory and pull kids out of the story. The result is that kids construct meaning around the interactive features of the story instead of the actual story. Junko Yokota, director of the Center of Teaching Through Children’s Books, also points out that as e-books begin to look more and more like films, the e-book producer chooses where to focus the reader’s attention. This takes the ownership of reading away from the child. When choosing e-books, she suggests thinking about whether the interactive features supports the storyline or distracts from it. As a general rule, the more specific the feature, the better it is for literacy. For example, if a character hisses at another, and an interactive feature provides a hissing sound, children can hear how the word hiss may differ from the word whisper. On the other hand, if an e-book simply provides a soundtrack of bird chatter each time birds are mentioned, that would likely become a distraction rather than a learning opportunity. Games are notorious distractors. If your child wants you to stop reading so they can drag baby lion cubs back to their den (as in Goodnight Safari) or touch floating blackberries to produce a juicy splat (one of many games in The Tale of Peter Rabbit), you have crossed over into screen-time territory. One of the greatest benefits of reading to children is that it provides opportunities for children and parents to talk about things they generally don’t cover over the general course of the day. Stories provide models that teach young children how to navigate peer and family relationships. Talking about stories together is the precursor for the skill children need most in school: the ability to thoughtfully analyze and critique different types of texts. When e-books enter the picture, the substance of parent-child talk changes. Instead of predicting what will happen next in the story, conversations revolve around the device. Parents discuss how to navigate to the next page, reorient a screen, or turn up the volume. These discussions aren’t bad, they just are not a win for literacy. While you are teaching the skills needed to utilize technology, don’t forget to keep up conversations about the story and illustrations as well. Another understandable but regrettable fact is that children often read e-books with minimal adult involvement. I often have the best of intentions when I pull out my tablet, but all too soon I am distracted with the baby or the kitchen stove, and my toddler is left happily zapping monsters and splatting blackberries. Many e-books are simply not good literature. Anyone can dash off an e-book and put it on the market, whereas traditional books are much more likely to be higher quality. Traditional authors have their stories accepted in the highly competitive publishing industry, where their books are professionally illustrated and edited. Most people involved in the process have an understanding about storytelling and early child literacy. This is simply not happening currently in the app market. Even worse, quality traditional books are often poorly reimagined as digital books. Even critically acclaimed books can turn in to literary disasters when converted to e-books. The app versions of Beatrix Potter’s books retain her beautiful illustrations, but are full of distracting games and features. Dr. Seuss books have several inconsistencies in matching text to illustrations (if a child touches different pieces of furniture, they only hear the word “house,” for example). 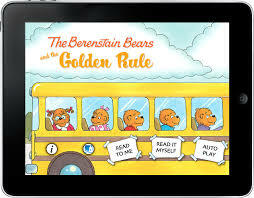 Unlike children’s book publishers, those in the digital world are not necessarily educated in children’s literacy. Yokota notes that she is “frequently struck by how little the developers of products seemed to know about how children actually learn to read.” Therefore is becomes the job of us parents to suss out not only good ebooks, but also good digital adaptions of our favorite traditional books. The more specific the feature, the better it is for literacy. In the name of research, I downloaded Nighty Night on my phone and shared it with my daughter. She had fun reading the story, tickling the animals, and putting them to sleep. But after getting into her own pajamas, she brought me a paperback copy of a Bernstein Bears book. Apparently e-books won’t make the cut for her bedtime story after all.